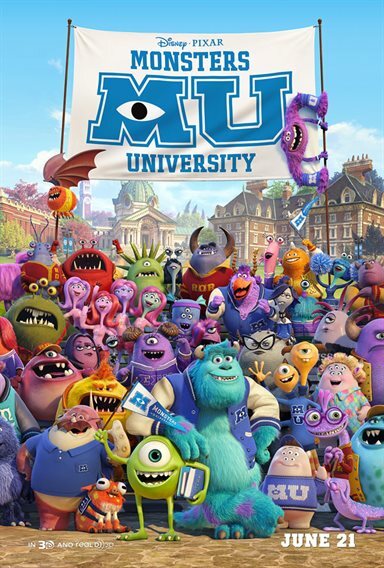 Download Monsters University in Digital HD from the iTunes store. Monsters University images are © Walt Disney Pictures. All Rights Reserved. Bringing back two of my favorite cartoon characters Sully and Mike with a prequel called Monsters University, Pixar presents renewed delight. The madness that the two opposites brought to Monsters Inc more than ten years ago doubles in Monsters University, while providing a lot of heart and a college year full of laughs. A follow up to a great animated film like Monsters Inc would not have been easy and would have required a lot of repetition, a stretch for new characters and a continued storyline that would be hampered with the lack of surprise. I like the way the writers chose to do the startup relationship between the two characters that takes on a whole new atmosphere filled with wonders they can let loose with their brand of comedy and it shines. The story starts with Mike having his dream of becoming a scare monster for the Monster Energy Company. Being this one-eyed goofy character that is more cute than scary, Mike doesn't fall into the frightening category for monsters. However, he's very determined and he finds himself taking his first step onto the campus of Monsters University. After meeting his new roommate Randy Bogs (yes the same little lizard guy from Monsters Inc) he gets a tour of the campus. Mike finally sees the School of Scaring and makes it his first choice for a degree. Here is where he gets introduced to Sully, the son of one of the top students in Monsters University. All into himself, even the instructor Professor Knight (voice of Alfred Molina) has his eye on Sully for something big. When the two come together for a campus fright contest quite by chance, the big challenge is for both of them to work together and complete their degrees. The voice talent has grown with Helen Mirren as evil Dean Hardscrabble a daunting overseer of the School of Scarring at Monsters U. She's a tough old bitty part centipede the rest bat winged crab. Taking top honors in acquiring screams from tots has put her in charge of the incoming scholars and it's her choice whether they stay or get booted out of her classes. I like this character more than Roz in Monster's Inc who oversaw the operation of closet door entry into the human world as Hardscrabble is more of a sinister character. Other new characters that really add comedy include the furry neck pillow scary frat guy named Art (Charlie Day) who's clueless, Terri and Terry Perry (voices of Dave Foley and Sean Hayes) a monster with two heads that often disagree with each other, and Scott "Squishy" Squibbles (voice of Pete Sohn) one of Mikes fraternity brothers who's always seems to see things in an agreeable fashion (maybe it's because he has five eyes). There are tons of new faces in Monsters University so the computer graphics and design crew must have been kept real busy coming up with that many characters. The computer animation here is still tops in the graphics business with colorful backgrounds, attention to detail and great special effects. The 3D does give the film a good depth of field and you get showered from time to time with confetti, water, and many other darting elements. Bringing the campus to the screen, showing the fraternity rush week, tours of the buildings, a special library full of books and several locations during the Scare Games, shows the amazing creativity of the crew who computerized the film. Monsters University has been rated G by the MPAA and really contains very little material that would be disturbing to most children except for a few monsters that aren't very fluffy. The film plays well to the older crowd mainly because it takes place at college where most adults can equate. Afternoon movie with the kids. Hope it's entertaining.